The Atacama desert in northern Chile has become a popular destination with adventure travelers combining it with their trip to Patagonia at the southernmost tip of the world. Not that the two are remotely close in proximity: they're 2,700 miles from each other at opposite ends of the second longest country in the world. But despite the time it takes to get to the Atacama, trust me my fellow adventurers, it's so worth the trip! If you're among the thousands of travelers heading to the Atacama soon, you'll have to decide on the best way for you to get around. You could hire a private driver or take group tours to see the amazing sites in the Atacama Desert - all good ways to see the desert sites and not have to worry about driving. But if you're like me and want the flexibility to stop on a dime or for every photo op imaginable, consider renting a car. There are so many amazing sites to see and places to explore in the Atacama and driving on your own is the way to go if you want to see more of it. You may think you need a 4-wheel drive but not so. We did just fine with our trusty Kia Morning, the ultimate all-terrain vehicle! Kidding aside, it got us where we needed to go! 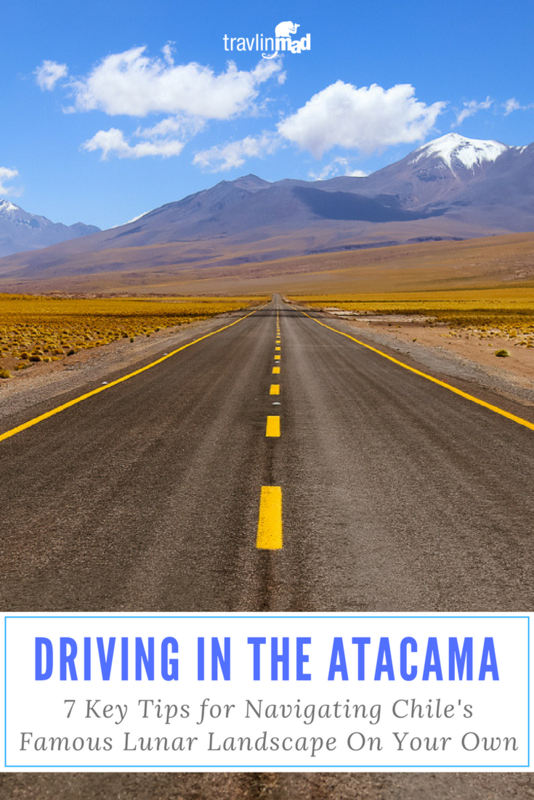 Driving in the Atacama desert is easy, but can be slow going. It can also take unexpected - and possibly dangerous - turns. But with basic common sense, you shouldn't have a problem navigating and getting around. Just keep these tips in mind when you go. Like any desert environment, the landscape here is sand, rock, and occasionally mud if you find yourself in a small oasis. Places like the Valle de la Luna and Valle de la Muerte have many secondary roads of hard-packed sand that can quickly turn to just sand. The wind can cause sand drifts just about anywhere and it only takes a few inches for your car tires to get buried. If the sand is wet enough, areas of quicksand can be dangerous if you wander or drive into them. So stick to the main roads, and leave your car on a hard surface if you want to explore further on foot. It may seem obvious, but you should really watch your speed in the Atacama because of the landscape rather than law enforcement. Driving on dry, gravely roads and sandy surfaces can cause you to slip and slide on small pebbles if you're going just a little too fast. There are few guardrails in the desert, and you can quickly slide around those corners that sneak up on you. Road surfaces can also change quickly from good to bad, or bad to worse, and it can be hard to see it coming. Roads can also be washed out in areas, or strewn with boulders from volcanic activity. The Atacama desert is one of the highest deserts on Earth, so the night skies are clear and unobstructed, making it one of the best places to see and photograph the night sky. You may want to explore the area at night as well. I took the astro photo below at the scenic overlook along the main road near the entrance to the Valle de la Luna. The bright moon wasn't ideal for photographing the stars but I was happy to have it when we were driving back out. We wanted to see the geysers at El Tatio gushing their hot water plumes in the early morning, but in order to see them go off at 5:30am you need to get up and leave by 3:30 or 4:00am. It's minimally a 2-hour drive from San Pedro de Atacama up 14,000 feet through total darkness - there are no street lights, houses, or ambient light of any kind along the way - just the light from your own headlights. If you can, try and keep pace with another car or tour van headed that way. If there are none, just be extra careful! Driving in the dark in the desert - with no guardrails, few directional warning signs, and some very steep drop-offs - can be the trickiest part of driving here, but also the most rewarding. Take is slow, and you'll be fine! The main road from the airport in Calama to the town of San Pedro de Atacama is paved and well maintained and easy to drive. Where some people can get in trouble however, is driving at certain times of the day, namely sunrise and sunset. You'll see numerous roadside memorials, called animita, as you drive along this stretch of road. The rising and setting sun at this high altitude can play tricks with your eyes when you're driving, and there is very little structure to block it for the entire 2 hour drive. The road is also heavily traveled by tractor trailers and construction trucks who move along at faster speeds. Driving in and out of the town of San Pedro de Atacama is fairly straight-forward, but that doesn't mean it's not without its challenges. It can be difficult to distinguish one street from another because they all look similar - one dusty street or adobe building after another. Navigating through the town can feel like you're in a maze. So make mental notes of the colors of buildings, outside gates, special signage or other distinguishing features. San Pedro has a lot of narrow, one-way streets, Do Not Enter signs, pedestrian traffic, and very few street signs outside the main tourist area. Bring a friend to help you navigate around town. Parking can also be challenging in town. It's best to find a designated parking area, leave your car and walk where you need to go. And it's so much more interesting too! There are herds of guanaco everywhere in the Atacama, and most often they're running toward members of the herd and away from predators or humans. They're pretty fast, so keep your eyes out for them. Guanaco aren't the only animals you'll see along the road. Burros, horses, flocks of birds, wood ducks, grazing llamas and alpacas, and other wildlife are all around as well. Don't wait too long to get petrol and to top-off every day or at least every other day. There is literally only one petrol station in the town of San Pedro de Atacama that is hard to find, to say the least. Don't look for bright neon signs - this one looks like you're driving into private property off a narrow side street far from the main tourist area. There's only one set of fuel pumps so the line can be long depending on the time of day. NOTE: U.S. residents should also remember that fuel here is sold by the liter and not the gallon. If you're looking to discover the Atacama desert in depth, we highly recommend doing your own driving. The added flexibility gives you so much more freedom to get out and explore!